From when I can remember I have always loved books. More than that, I love collecting books, and being in their company. The smell of the paper in a new book still makes me go gaga and nothing in the world can match it. My two visits to the Jaipur Literature festival, in 2012 and 2013, have been quite enriching and totally worth every minute spent there. Being amidst books gives me an unparalleled high. Continuing the love, I was eagerly waiting for the bi-annual show – The New Delhi Book Fair, held at Pragati Maidan in Delhi. It is India’s oldest book fair, with the first one being held in 1972! I was very surprised to know, and am sure many of you would be too, that “India is the third biggest market for English publications with almost 12,000 publishers that publish around 90,000 titles a year in more than 18 languages”. In a country like India, that still has substantial illiteracy rates, this comes as a welcome surprise. With the up surging middle class and increased literacy and awareness we sure are on the way to be no. 1 very soon. The theme for the book fair was “Books in Indian Cinema”. This sure seemed like a step towards commercialization of the property to attract the youth of today. 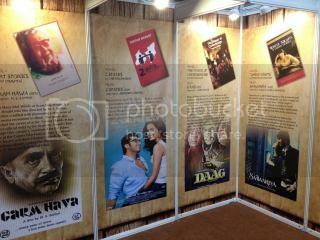 The only linkage to the theme was a small exhibition setup with posters of various movies, which have been inspired from books. No mention of the theme in the stalls, or a shelf stacking such books! Nothing! 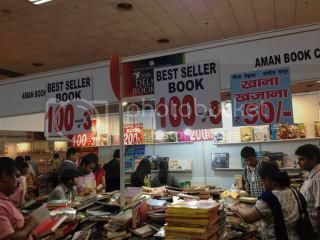 The book fair in itself was huge spread across 6 large halls of the overflowing Pragati Maidan, and there was substantial crowd. Stalls by every major bookseller were available and coupling it with cafeteria options from the likes of Costa Coffee made it a perfect hangout place. Sadly that is what it turned out to be. Admit that this is a book fair and not a literature festival, but the focus on commercializing the event super ceded the intellectual stimulation expected out of it. it more seemed like a garage sale of books than a exhibition of the complete range of books by each of the book publishers. I think this is what happens when you invite booksellers to setup a stall. For me, a book fair is a place for the publishers, distributors to showcase their wares and collection to the end consumer and a wonderful place to network among the entire stakeholder chain of this business called books. The latest change – ebooks, should also have been invited in a big way and the end consumer could have been witness to the pros and cons of this medium and given a glimpse to the future. What it turned out was a garage sale. All the booksellers were out there to empty their stockpiles of books that have been collecting dust in their outlets. Rs. 100 for 2 books one claimed, 3 said another, leading to a mad rush for people ready to deck up their bookshelves. Alas! That is all it turned out to be. Would I visit it next time? Of course I would. But this time the mindset would be to strike a bargain to fill up my bookshelf, and nothing else!